The iPhone is great at many things. It allows us to view our calendars, messages and contact numbers, and access the weather, news around the world, and just about anything else we could possibly want in a few simple finger swipes and touches. Did you know that your iPhone could also literally save your life some day? Check out a few of these astounding stories below in which the owners’ Apple devices saved their lives! 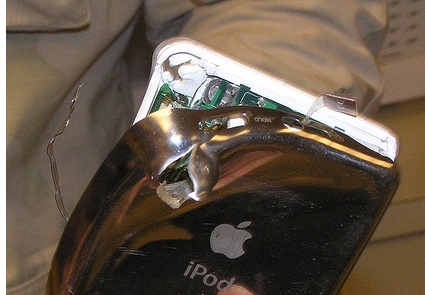 An iPhone Stops a Speeding Bullet – Recently this past February, an iPhone was able to save the life of a 49-year-old Dutch man who was sitting in his van at the time that several unknown people opened fire on him. Five bullets were shot, and while four missed completely, one bullet found its way to the victim’s chest. Luckily, the man had his iPhone in his shirt pocket at the time of the event. 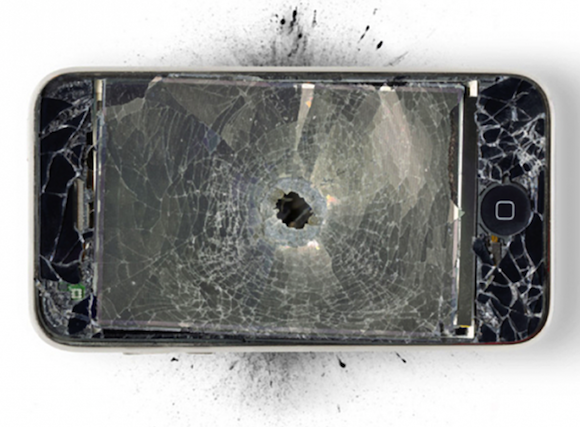 The bullet shattered the iPhone’s glass, but the phone prevented the bullet from causing any major injury or death from occurring. He now has placed his damaged iPhone in a place of honor in his home to remind him how fragile life is. An iPhone App Saves a Basketball Player’s Life – A coach and a simple $1.99 iPhone app are given credit for saving a young basketball player’s life on the day before Thanksgiving in 2010. Xavier Jones from Southern California was participating in basketball practice when he stumbled, stopped, and collapsed on the floor. His heart had stopped, and he was no longer breathing. His coach, Eric Cooper, and the assistant coach, John Osorno, gave him cardiopulmonary resuscitation and were able to restore his breathing. By chance, Cooper had studied up on CPR the night before, reading instructions from an app called Phone Aid. Xavier was later diagnosed with hypertrophic cardiomyopathy, which is a somewhat deadly thickening of the heart and can hinder the blood flow. Now the senior is just happy to be alive. An iPod Saves a U.S. Soldier From Enemy Gunfire – iPhones aren’t the only devices that can save lives! Kevin Garrad of the 3rd Infantry Division credits his iPod for saving his life when he was on street patrol in Tikrit, Iraq. While patrolling he encountered a group of insurgents who shot at him, and the soldier was hit in the chest with a bullet from an AK-47. By chance, the soldier kept his iPod in his outside pocket, and the device slowed the bullet down so much that it didn’t even touch the soldier’s body armor. An iPhone Saves the Life of a Man in Haiti’s 2010 Earthquake – We all remember the horrible earthquake that struck Haiti on January 12, 2010, and the destruction that it caused. People were buried beneath rubble for days or even weeks after the earthquake. One man who was trapped in the rubble was U.S. filmmaker Dan Woolley, who was visiting Haiti to shoot a video about poverty when the earthquake struck. Because of his iPhone, Dan survived being crushed by a pile of rubble by teaching him how to treat his wounds. He was also able to use the digital SLR to illuminate the area around him and took pictures of the damages. Once he took refuge in an elevator shaft, Dan followed instructions from a first-aid app on his iPhone to make a bandage and tourniquet for his leg and cease the bleeding from his head wound. He also set his phone’s alarm to go off every 20 minutes since the app discouraged falling asleep in case he’d go into a coma. Nearly 3 days later, he was saved by a French rescue team and was brought to safety. It’s remarkable that these devices were able to save the lives of these people! Just think, though, if your phone or theirs were protected by a Bodacious Case. The Bodacious Case is not only stylish but also incredibly durable. The next time you consider a case for your iPhone, consider a Bodacious Case. Who knows? Your life might be saved!